When your pet has an infection, you not only want to treat it, you want to soothe your pet's symptoms. 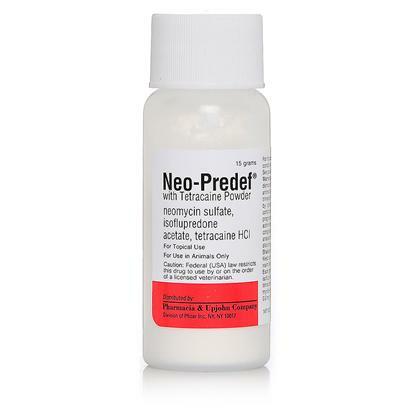 NEO-PREDEF with Tetracaine Powder contains an antibiotic, an anti-inflammatory, and an anesthetic for treatment of ear and skin infections, as well as some dermatitis conditions responsive to the active ingredients. So NEO-PREDEF does more than treat the infection; it also delivers much-needed relief to your cat, dog, and even horse. May include redness, irritation or swelling. If this persists or increases, discontinue use and speak to your veterinarian to redetermine diagnosis.